A wide selection of fabric from well-known designer Kaffe Fassett, ranging from delicate pastels to spectacular abstract and floral-derived patterns. Follow links on the right to view our stock. Just arrived: Two sets of sewing and quilting/embroidery threads from Kaffe Fassett, complementing his fabric ranges. 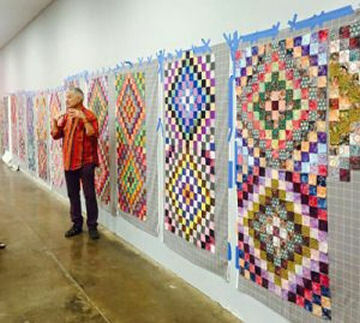 If you are attending one of Kaffe Fassett's and Brandon Mably's patchwork workshops, you will need to purchase 2 metres of his design wall flannel - it seems a lot, but you will wonder afterwards how you ever managed to plan a quilt without it! For full details of what you need for his workshops, visit Kaffe Fassett workshops.